Hey hey it’s the weekend! This week has contained many work related stresses so I’m glad to be off for the weekend. 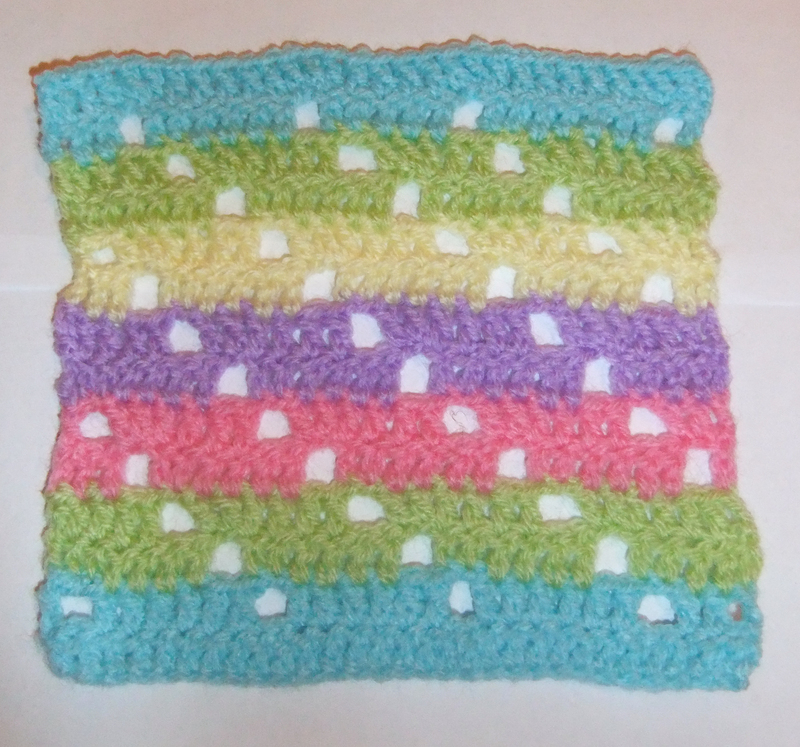 This is a really bright fun square that involved tr (UK) and ch stitches. The pattern is made up of a foundation row and then 4 rows that are repeated twice. This pattern is made up of 7 rounds of dc and tr. I’ve chosen a dark background colour so that the pink ‘flower’ in the middle stands out. 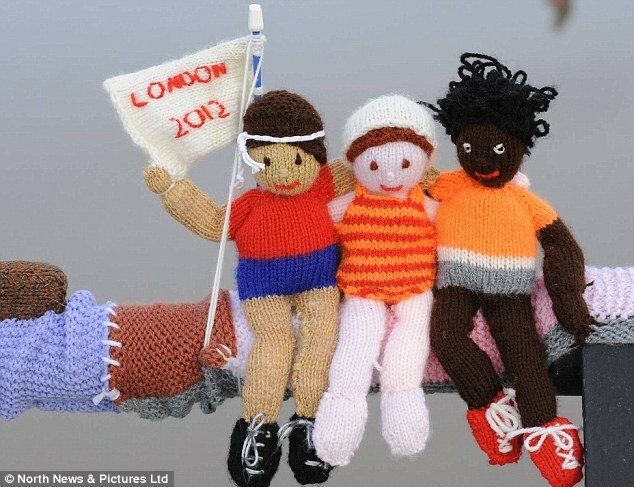 On Wednesday night I was reading a newspaper online and discovered a story about the ‘Saltburn Yarnbomber‘ – an anonymous creator of a woollen display showing various wool Olympic figures such as a rower, swimmer, gymnast and many more. This 50 yard scarf was stretched along the railings by the seaside in Yorkshire, England. So much work has obviously gone into making this, I wonder how long it will stay there and if anyone will ‘rescue’ it? This whole ‘yarnbombing’ craze has got me thinking, maybe I could attempt a mini-yarnbomb with a bit of crochet. Well whatever crafting you have planned, I hope you all a good weekend and I look forward to seeing the results on your own blogs. Haven’t bought wool since October, maybe before. Promised myself I wd work through my stash making things for charity. And I have. Went to ards today and stocked up on double knitting on that little shop Cotters. Cheap and cheerful. Just my thing! It’s hiding behind the sofa that Jon is sitting on at the mo. how do I rescue it without him noticing…? Tell him it’s his turn to put the kettle on, then grab it quick while he’s out of the room, that’s what I do! Hi there, thanks for popping into my blog the other day. 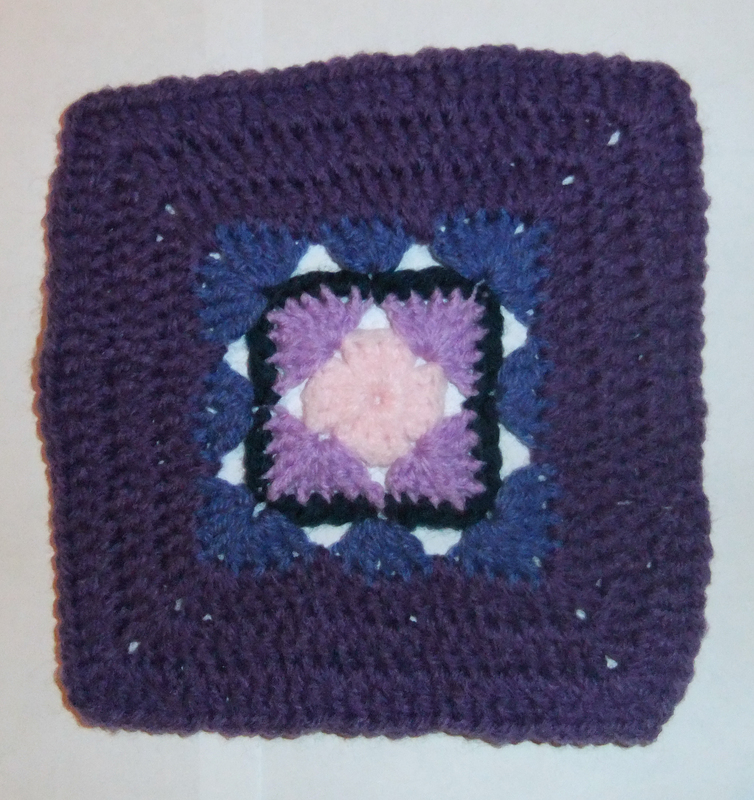 I have really enjoyed looking at your crochet blocks. I have quite a bit of that Stylecraft ‘special’ yarn and I like it a lot. It’s cheap, smooth and comes in lovely colours. You can’t ask for much more. 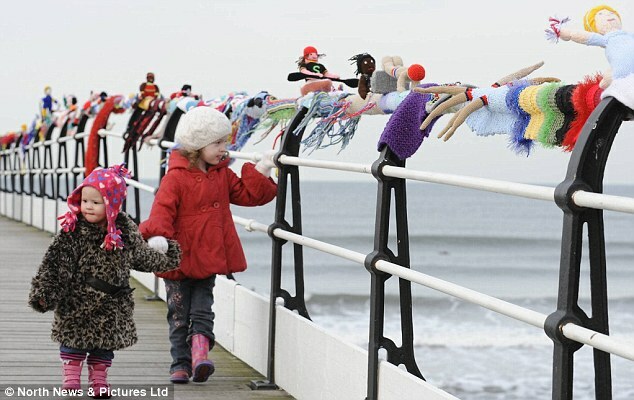 Thanks for the link to the Saltburn Yarnbomber. My Mum told me about it but there’s nothing like a visual. It’s just down the road from me so I think a trip is in order…. My eldest son has to write a ‘non-chronological report’ on the Olympics this week so perhaps sooner rather than later. That’s ok – glad to be of help. I think it’s amazing that someone made it (or maybe it was a group of people). I hope it’s still there when you visit. We went to see it after school tonight. It was a lot of fun. I am planning to post some pictures soon. Thank you for dropping by my blog. All that yarn must beckon you each day. The blocks you’re crocheting are intriguing, and I love your beautiful dedication dress for your little one. The cardigan is an absolute delight. I used to love making children’s sweaters. I haven’t had the time in quite a while. The flowers are lovely! So full of sunshine and cheer. Thank you Marianne for your lovely message. I’m looking forward to reading more of your blog. Thank you for liking my blog. Its all new to me. So it may look funny from time to time. I enjoy looking at yours too. I’m the same, I’ve only been doing mine a month! I have an image of someone creeping round their neighbours garden like the Hamburgular (McDonalds adverts from years ago). Yarnbombing seems quite cool – I may give it a go! I love the eyelet lace! Put the yarn under a bed? I stuff all sorts under mine! Thanks – looking forward to seeing your make. That’s always nice to see great work of other yarnbomber. Keep on going with Your (our!!!) funny stuff and make people smiling. Good for you, I hope you get to accomplish what you want this weekend. I hope to start some crochet baby mary jane shoes.